In mathematics, a polynomial is an expression consisting of variables (also called indeterminates) and coefficients, that involves only the operations of addition, subtraction, multiplication, and non-negative integer exponents of variables. 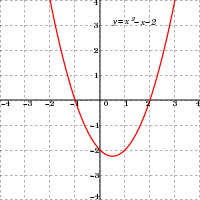 An example of a polynomial of a single indeterminate, x, is x2 − 4x + 7. An example in three variables is x3 + 2xyz2 − yz + 1. The x occurring in a polynomial is commonly called either a variable or an indeterminate. When the polynomial is considered as an expression, x is a fixed symbol which does not have any value (its value is "indeterminate"). However, when one considers the function defined by the polynomial, then x represents the argument of the function, and is therefore called a "variable". Many authors use these two words interchangeably. It is common to use uppercase letters for indeterminates and corresponding lowercase letters for the variables (or arguments) of the associated function. represents no particular value, although any value may be substituted for it. The mapping that associates the result of this substitution to the substituted value is a function, called a polynomial function. That is, a polynomial can either be zero or can be written as the sum of a finite number of non-zero terms. Each term consists of the product of a number—called the coefficient of the term—and a finite number of indeterminates, raised to nonnegative integer powers. The exponent on an indeterminate in a term is called the degree of that indeterminate in that term; the degree of the term is the sum of the degrees of the indeterminates in that term, and the degree of a polynomial is the largest degree of any one term with nonzero coefficient. Because x = x1, the degree of an indeterminate without a written exponent is one. The derivative of the polynomial anxn + an−1xn−1 + ... + a2x2 + a1x + a0 is the polynomial nanxn−1 + (n − 1)an−1xn−2 + ... + 2a2x + a1. If the set of the coefficients does not contain the integers (for example if the coefficients are integers modulo some prime number p), then kak should be interpreted as the sum of ak with itself, k times. For example, over the integers modulo p, the derivative of the polynomial xp + 1 is the polynomial 0. A primitive integral or antiderivative of the polynomial anxn + an−1xn−1 + ⋅⋅⋅ + a2x2 + a1x + a0 is the polynomial anxn+1/(n + 1) + an−1xn/n + ⋅⋅⋅ + a2x3/3 + a1x2/2 + a0x + c, where c is an arbitrary constant. For instance, the antiderivatives of x2 + 1 have the form 1/3x3 + x + c.
for all x in the domain of f (here, n is a non-negative integer and a0, a1, a2, ..., an are constant coefficients). , and thus both expressions define the same polynomial function on this interval. 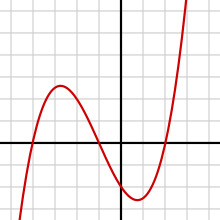 called the polynomial function associated to P; the equation P(x) = 0 is the polynomial equation associated to P. The solutions of this equation are called the roots of the polynomial, or the zeros of the associated function (they correspond to the points where the graph of the function meets the x-axis). In the ancient times, they succeeded only for degrees one and two. For quadratic equations, the quadratic formula provides such expressions of the solutions. Since the 16th century, similar formulas (using cube roots in addition to square roots), but much more complicated are known for equations of degree three and four (see cubic equation and quartic equation). But formulas for degree 5 and higher eluded researchers for several centuries. In 1824, Niels Henrik Abel proved the striking result that there are equations of degree 5 whose solutions cannot be expressed by a (finite) formula, involving only arithmetic operations and radicals (see Abel–Ruffini theorem). In 1830, Évariste Galois proved that most equations of degree higher than four cannot be solved by radicals, and showed that for each equation, one may decide whether it is solvable by radicals, and, if it is, solve it. This result marked the start of Galois theory and group theory, two important branches of modern algebra. Galois himself noted that the computations implied by his method were impracticable. Nevertheless, formulas for solvable equations of degrees 5 and 6 have been published (see quintic function and sextic equation). In computer graphics they are used to interpolate between values to evaluate animation of dynamic graphical objects. ^ The coefficient of a term may be any number from a specified set. If that set is the set of real numbers, we speak of "polynomials over the reals". Other common kinds of polynomials are polynomials with integer coefficients, polynomials with complex coefficients, and polynomials with coefficients that are integers modulo of some prime number p.
^ This terminology dates from the time when the distinction was not clear between a polynomial and the function that it defines: a constant term and a constant polynomial define constant functions. ^ a b c d Barbeau, E.J. (2003). Polynomials. Springer. pp. 1–2. ISBN 978-0-387-40627-5. ^ Weisstein, Eric W. "Zero Polynomial". MathWorld. ^ Edwards, Harold M. (1995). Linear Algebra. Springer. p. 78. ISBN 978-0-8176-3731-6. ^ a b c Edwards, Harold M. (1995). Linear Algebra. Springer. p. 47. ISBN 978-0-8176-3731-6. ^ Some authors use "monomial" to mean "monic monomial". See Knapp, Anthony W. (2007). Advanced Algebra: Along with a Companion Volume Basic Algebra. Springer. p. 457. ISBN 0-8176-4522-5. ^ Salomon, David (2006). Coding for Data and Computer Communications. Springer. p. 459. ISBN 978-0-387-23804-3. ^ Barbeau, E.J. (2003). Polynomials. Springer. pp. 64–5. ISBN 978-0-387-40627-5. ^ Barbeau, E.J. (2003). Polynomials. Springer. pp. 80–2. ISBN 978-0-387-40627-5. ^ Proskuryakov, I.V. (1994). "Algebraic equation". In Hazewinkel, Michiel (ed.). Encyclopaedia of Mathematics. vol. 1. Springer. ISBN 978-1-55608-010-4. ^ Leung,, Kam-tim; et al. (1992). Polynomials and Equations. Hong Kong University Press. p. 134. ISBN 9789622092716. ^ McNamee, J.M. (2007). Numerical Methods for Roots of Polynomials, Part 1. Elsevier. ISBN 978-0-08-048947-6. ^ Powell, Michael J. D. (1981). Approximation Theory and Methods. Cambridge University Press. ISBN 978-0-521-29514-7. ^ Gohberg, Israel; Lancaster, Peter; Rodman, Leiba (2009) . Matrix Polynomials. Classics in Applied Mathematics. 58. Lancaster, PA: Society for Industrial and Applied Mathematics. ISBN 0-89871-681-0. Zbl 1170.15300. ^ Horn & Johnson 1990, p. 36. ^ Irving, Ronald S. (2004). Integers, Polynomials, and Rings: A Course in Algebra. Springer. p. 129. ISBN 978-0-387-20172-6. ^ Jackson, Terrence H. (1995). From Polynomials to Sums of Squares. CRC Press. p. 143. ISBN 978-0-7503-0329-3. ^ de Villiers, Johann (2012). Mathematics of Approximation. Springer. ISBN 9789491216503.